It’s safe to say this season has been a fiasco for the Los Angeles Lakers. The team is 30-35, has lost four straight and is almost certainly not making the playoffs. Brandon Ingram is out for the season. Lonzo Ball is out for the season. LeBron James is on a minutes restriction and receiving so much criticism that Kyrie Irving feels sorry for him. Everything falling apart like this means head coach Luke Walton is almost certainly going to be fired this offseason, but the organization will likely have many more moves to make. 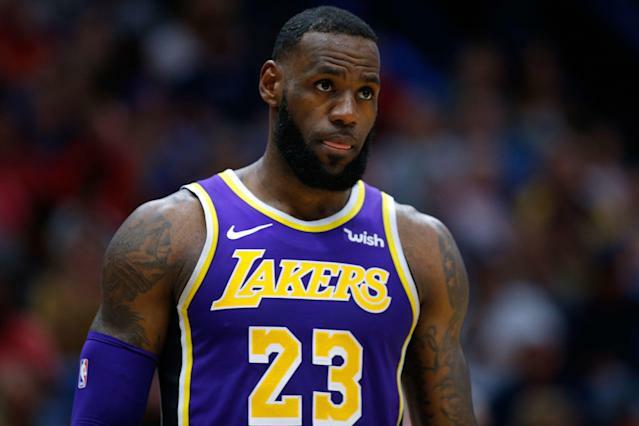 According to one ESPN analyst, the Lakers should consider one of those moves being a LeBron James trade. Yep, that’s the point we’ve reached this Lakers season. In the first quarter of another Lakers loss against the Boston Celtics on Saturday, the topic of the team’s future came up. Analyst Jeff Van Gundy dropped the idea of the Lakers ending James’ tenure, to the disbelief of fellow analyst Mark Jackson, who we should note has been mentioned as a possible replacement for Walton. The basic outline of Van Gundy’s idea: trade James to the Clippers primarily to free up cap space, then go after Kevin Durant, Anthony Davis and/or Kawhi Leonard. Van Gundy: I think in the offseason, they need to rebuild this roster, right? And to me, it could be a trade for an Anthony Davis, or I think they need to explore trading LeBron for getting as much as they can. Jackson: What are you doing, seriously? No, seriously, what are you doing? Van Gundy: You’ve got to get on the right timeline. I’m going to say, if I could trade him for the Clippers into cap space, which would give me a better chance to get Durant or Kawhi Leonard, would I not do that? Jackson: OK, LeBron James is not getting traded. OK? Van Gundy: You’ve got to put everything on the table. So yeah, it seems that Van Gundy believes that a Lakers team centered around Davis and one of Durant or Leonard would be better off than one led by James. Sure. Of course, there is no guarantee the Lakers get any of those players. And let’s not even get into how awful a look it would be for the organization to sign James to a four-year contract ostensibly so they can build around him, then kick him to the curb after one season. Any free agent would think twice about shaking Magic Johnson’s hand if that happened. This is all obviously hypothetical now, but it’s a very real indication of just how badly the Lakers’ plans have failed this season.